Opening a new restaurant serving Xi’an food (or Shaanxi food, if you prefer) in the seemingly barren concrete wastes of the Holborn-Bloomsbury-Russell Square hinterland appears bafflingly odd at first glance. Despite being wedged in between a pair of pubs, there’s not much in the way of passing foot traffic and most of the visitors filing out of the nearby British Museum will be beating a hasty path towards all the usual tourist traps. 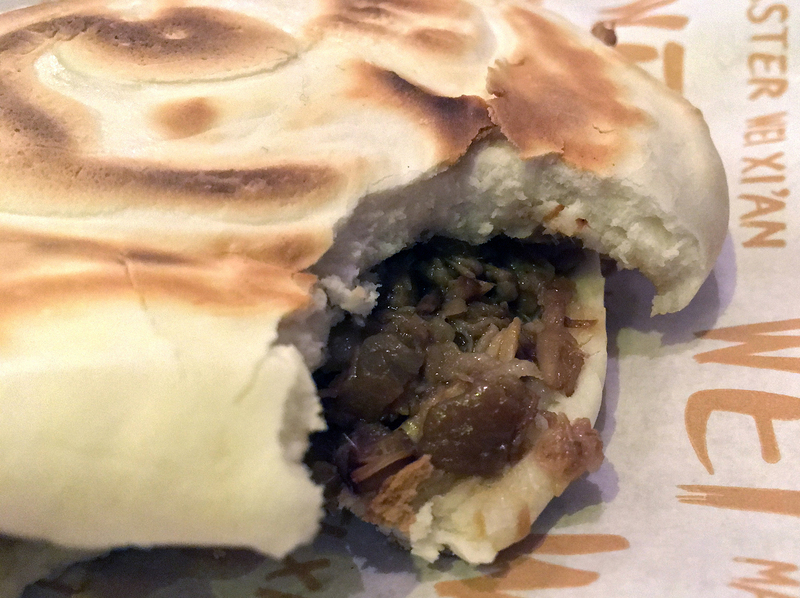 There’s a method to this madness though – and not just because Master Wei’s eponymous chef is used to plying her trade out of incongruous locations after heading up Xi’an Impression. When a disproportionate chunk of your clientele are Chinese students and other expats living, learning and working in the various ivory towers of the Holborn-Bloomsbury area, then it makes some sense to set up shop there to serve them in person or via cowboy capitalist huckster darling Deliveroo. 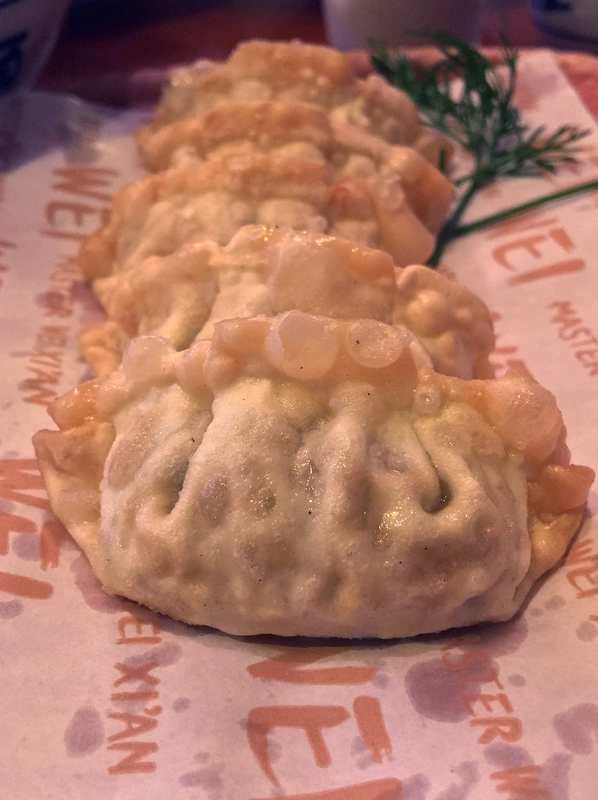 What is most immediately striking about Master Wei when you step through the door isn’t that it serves Shaanxi food, which is thankfully an increasingly common sight in zone 1. Nor is it the odd travel agent-style backlit panoramas of Xi’an lining the far wall. It’s the unfailingly warm, welcoming and polite yet efficient service. When many new and old Chinese restaurants alike still see your presence as an irksome burden to be unloaded at the earliest opportunity, such actual hospitality is like a drink of ice cold water in a sun-bleached desert. 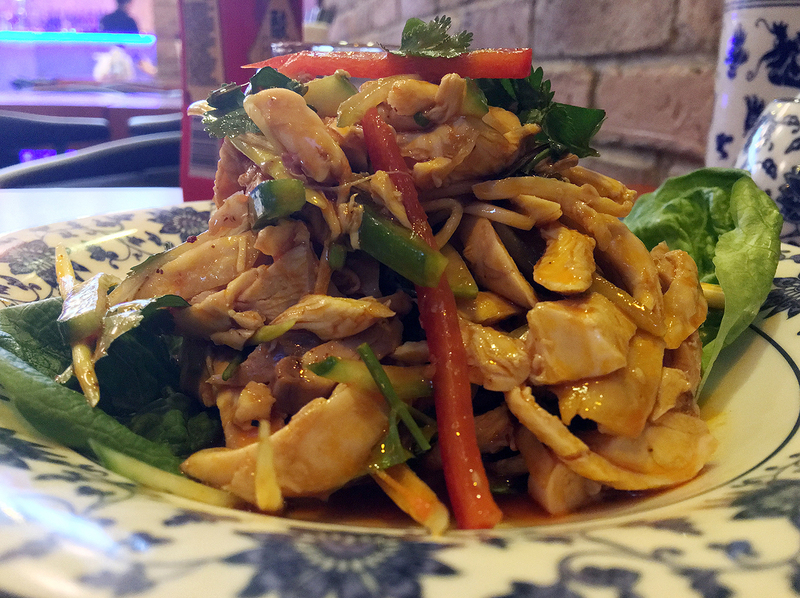 ‘Cold chicken in ginger sauce’ is a description that doesn’t do this starter any justice. Gamey chicken at room temperature came bathed in a layered sauce that had nuanced touches of chilli, sesame and spring onion as well as ginger. While almost certainly designed as a summer dish, its titillating charms are welcome at any almost time of year. Going cold chicken isn’t anywhere as strenuous as going cold turkey. Hand shredded chicken was similarly gamey, with the occasional slice still attached to bone and cartilage. The sauce was similar to the ginger sauce above, but with coriander and thin slices of sweet pepper changing the mix alongside a more pronounced tart sourness. Don’t prevaricate in choosing between the two – just have both. Chicken cooked on the bone is far less likely to be dull chicken. 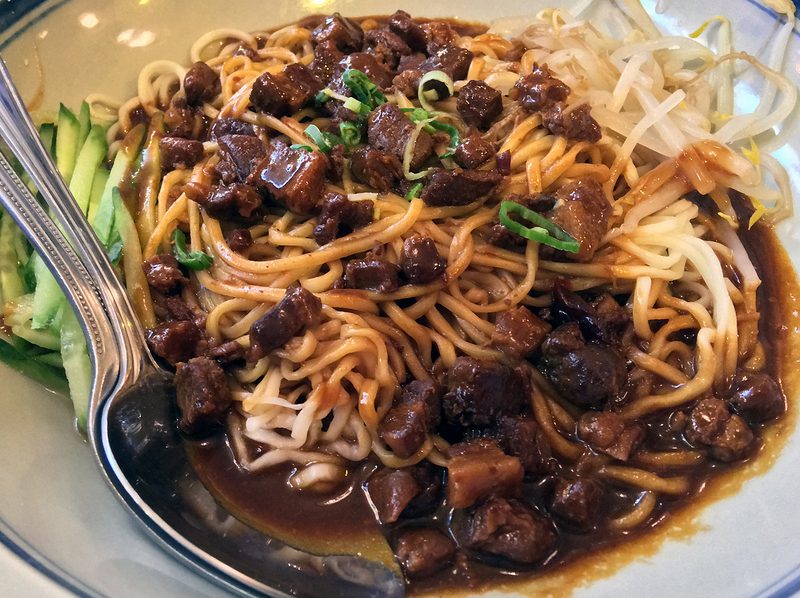 While highly credible, the liangpi noodles weren’t quite as superlative as the version of this dish available at either Murger Hanhan or Xi’an Biang Biang Noodles. There was still much to enjoy though, from the narrow yet thick and milky smooth noodles themselves to the bright, sharp and sour sauce. A few more bits of dimpled chewy seitan would’ve been welcome. Also available with sesame sauce. 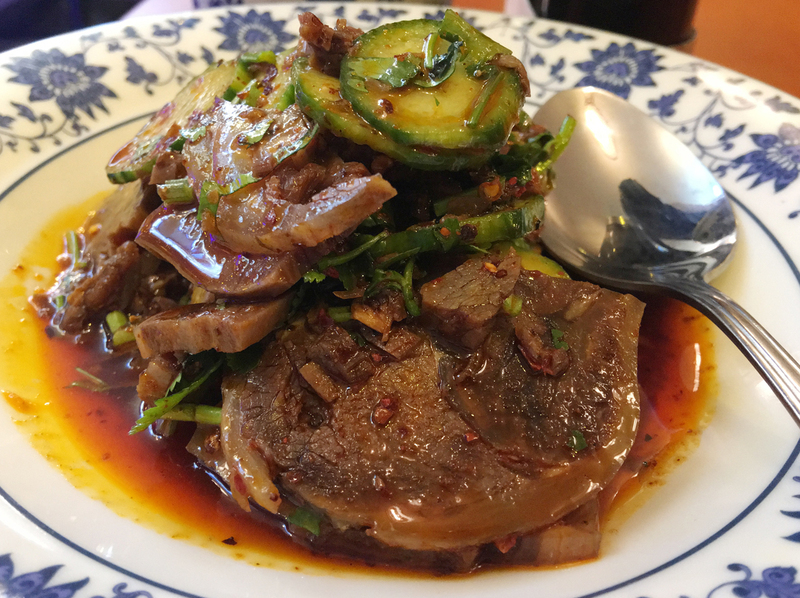 Chilled slices of dense, gamey beef and tenderised, refreshing cucumber were neatly bound together in a sharp, sour sauce. It all made for a far better beefy starter than some of the other bovine options available here. It is very cold in space. A strawberry salad is an eyebrow-raising inclusion on the menu of any restaurant. Whether it’s an expression of the head chef’s quirky inventiveness, a commentary on Chinese views of Western food or something else altogether, it just doesn’t work. The melange of sweet strawberries, punchy cherry tomatoes, wrinkly taut ear fungus and so-so radishes, lettuce and onions was an inoffensively and uninterestingly mild affair. 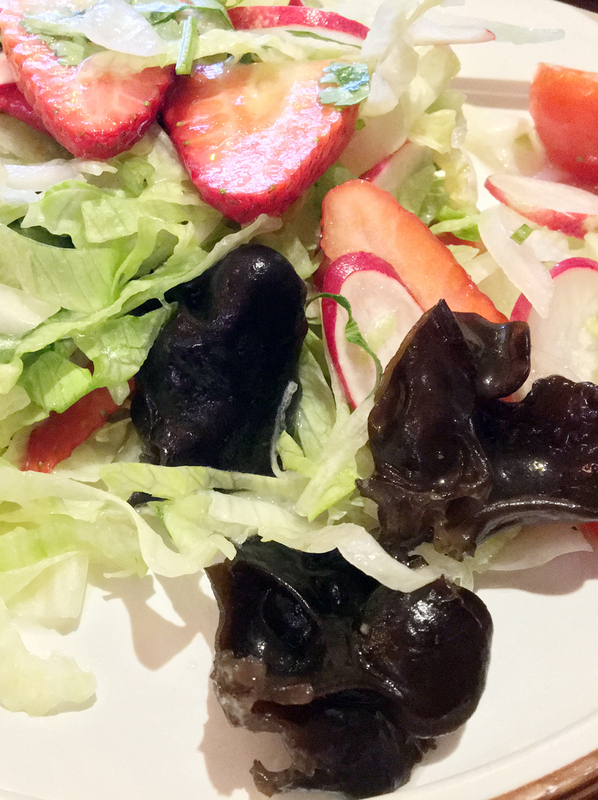 You’re better off just ordering the standalone ear fungus salad, as that was by far the most mouth pleasing element. Strawberry Fields, nothing is real. 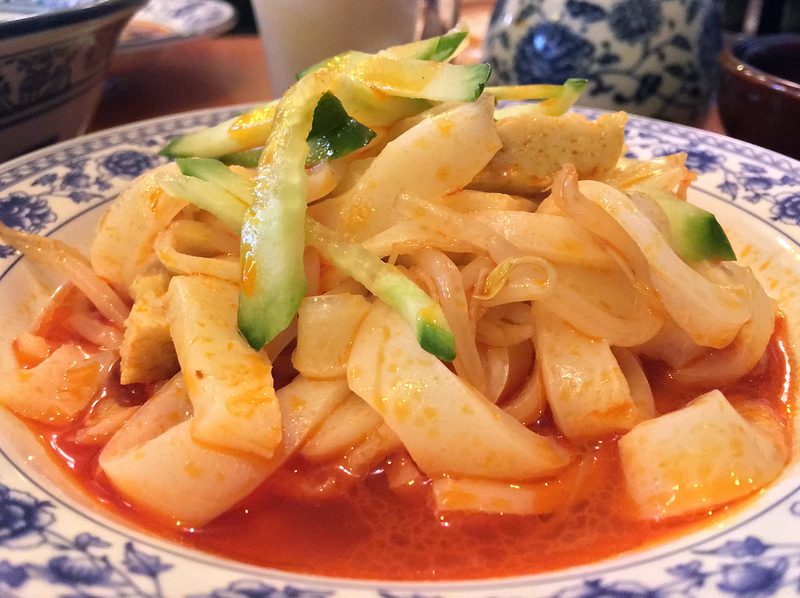 Spicy pickled vegetables looked like kimchi, but with an oddly tabasco-like heat that faded quickly. With none of the sour tart heat of a good kimchi, I quickly lost interest in this motley collection of cabbage and carrots. The accompanying kelp seaweed, on the other hand, was far more arresting. Served chilled, the emerald threads were not only refreshing and palate cleansing after the heat of some of Master Wei’s other dishes, but had a pleasingly complex texture too. It somehow managed to be both springy and lightly crunchy at the same time, while tinged with hints of sesame seed oil. I’d happily abstain from the ersatz kimchi and snort more of this kelp seaweed instead. 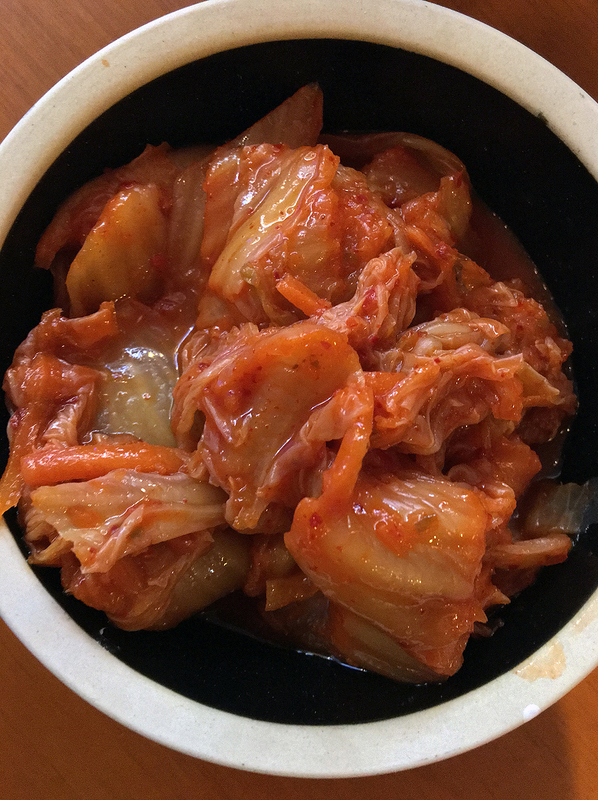 ‘Ersatz kimchi’ is probably an inappropriate term in this context. 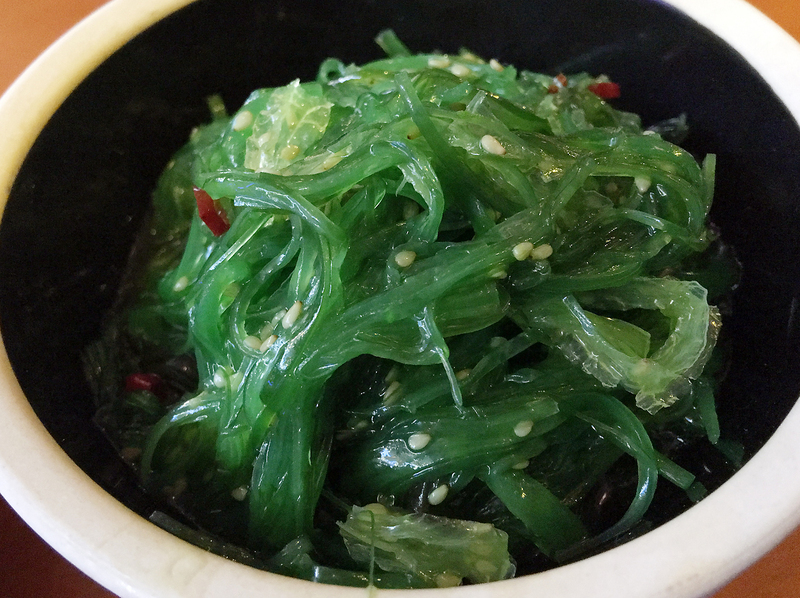 Unsurprisingly similar to an Okinawan chilled seaweed dish I had in Tokyo at Little Okinawa. Fried chicken and vegetable dumplings were a disappointment, inside and out, from the uninspiringly thick and crunchy skins to the mystery meat filling. These little parcels were highly dependent on the table sauces of musky chilli oil and vinegar for flavour. Chicken dumplings, fried. Not fried chicken dumplings. Which would be quite a feat. 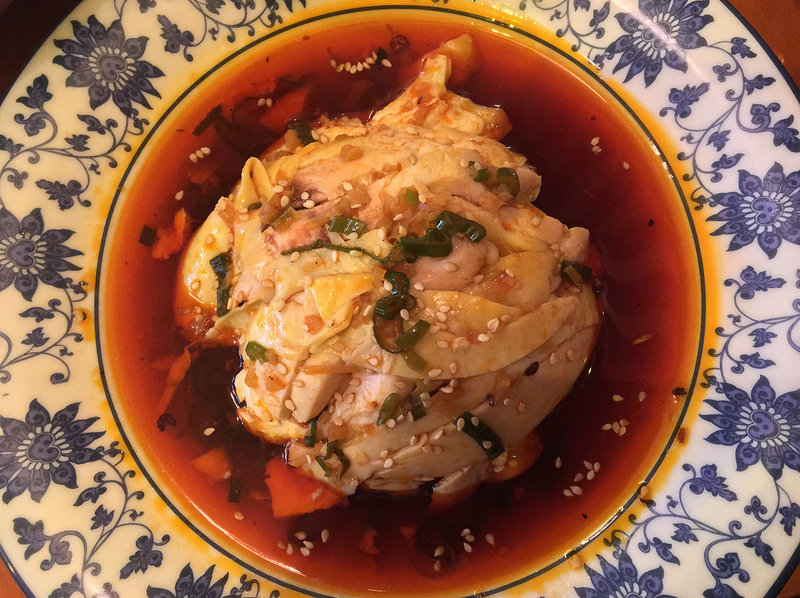 In a pleasant twist, the pork and seaweed dumplings were not a minor variation on the fried and chicken and vegetable dumplings, but a different beast altogether. The thinner skins were open-ended at each end, Xi’an style. I don’t know what the original intention was for this dumpling design, but I found that it helped the feral piggishness and umami of the quivering filling soak up the table sauces all the better. Exemplary. Where have you been all my life? Well, Xi’an presumably. Steamed pork and vegetable dumplings had a similarly richly oinkish filling, this time joined by crisp chive-like hits. The provided dipping sauce obscured much of its charms though, so it’s best avoided. 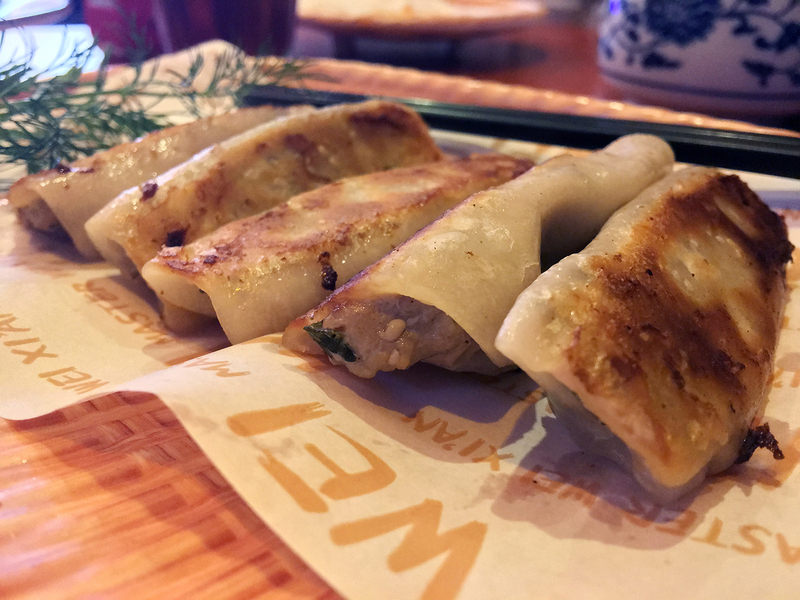 The dumpling skins themselves were thick and doughy, yet surprisingly light – all the better for appreciating the pork filling. The same pork and vegetable dumplings can also be had in a soup that was vaguely Thai-like in its lemongrass-like sharp sourness. It was pepped up even further by punchy little nuts and coriander. 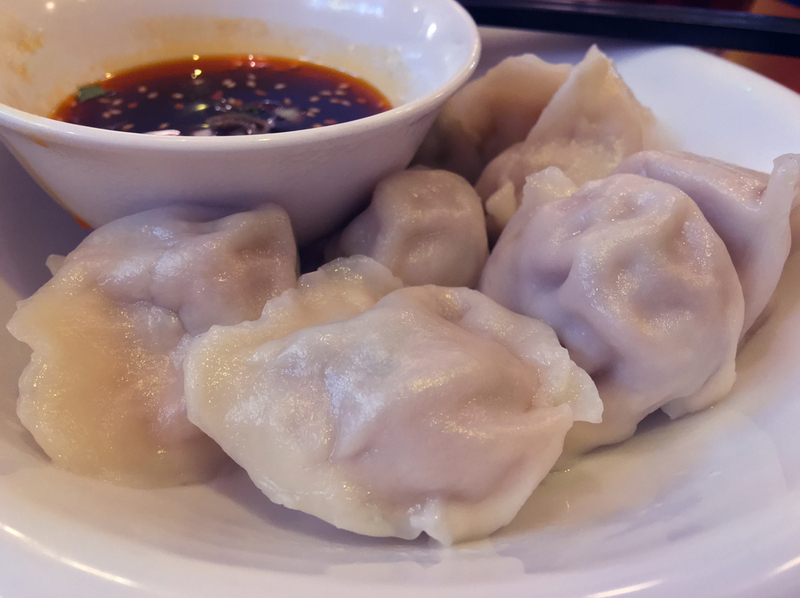 Although oily with only a mild heat, it nonetheless complimented the dumplings far better than the above dipping sauce ever did. 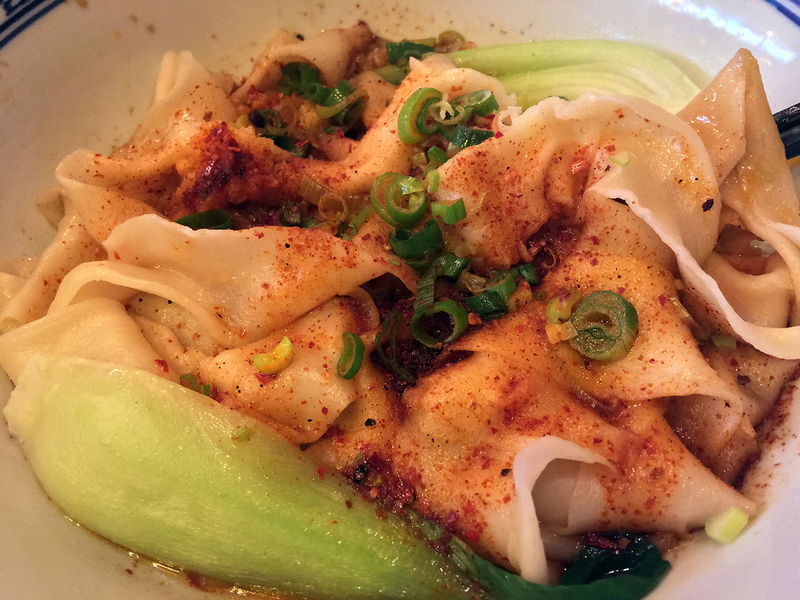 Dumplings in soup, not soup dumplings. That’s another thing entirely. 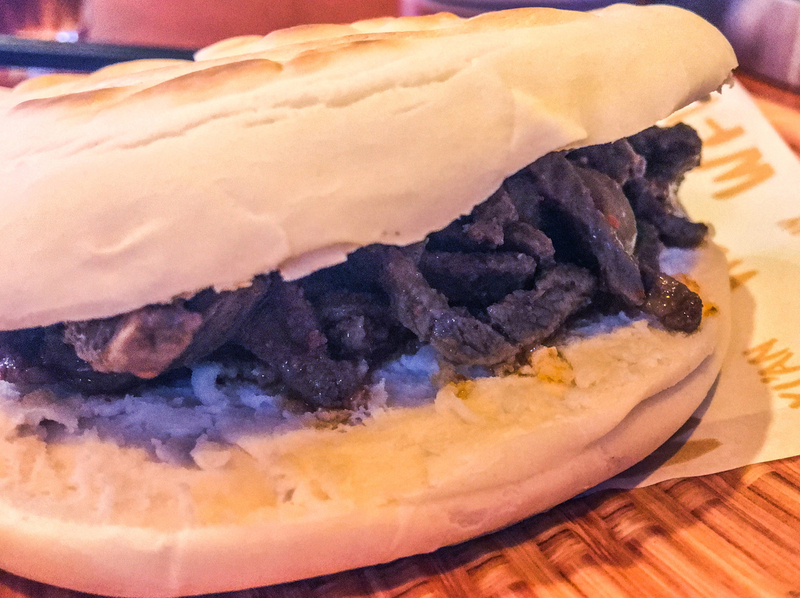 If you’re going to opt for one of the filled meat baps at Master Wei, then it’s best to opt for the fatty lamb roujiamo over the forgettable beef variant. The quality of the bread was a notable step up over the cardboard coasters at Murger Hanhan – soft, pliable and lightly chewy. Even so, I suspect the charms of these rather simple sandwiches have been lost in translation from Xi’an street food stall to sit-down restaurant. Any excuse for me to use the word ‘bap’. Baps. Baps, baps, baps. It’s one of those inherently wonderful words, so sue me. While the thread noodles and seaweed soup unsurprisingly had a winsome umami due to the seaweed, that wasn’t its only attraction. The thin vermicelli-looking noodles packed an earthy, vegetal moreishness behind their gently chewy texture, almost certainly due to being made from mung bean flour. The noodles’ mouthfeel was bolstered by the similarly thin yet chewy bits of seaweed, while the soup was not only umami but peppery too with a clean aftertaste. In my mind, this soup is an exemplar of what a vegetarian dish should be: its innate charms meant it not only had no need to imitate meat, but actually including any meat wouldn’t have made this soup any better. Thread through the eye of a noodle. 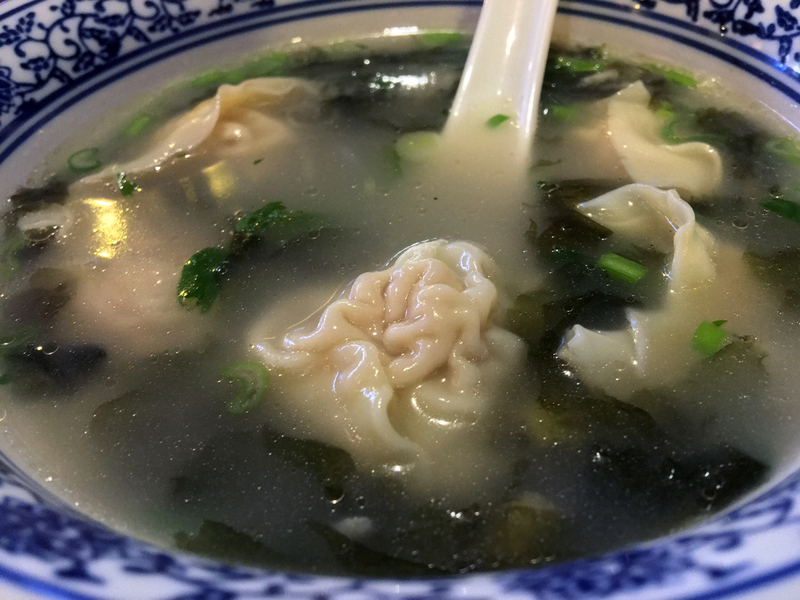 As if to drive this point home, the fluidic component of the wonton soup was nearly identical to the seaweed soup but without any pepperiness. It didn’t clash with the wontons, but neither were the two inseparably bonded. The thin, supple and wrinkly skins of the wontons and their quivering, oinkishly satisfying pork fillings would’ve been just as enjoyable without the soup and vice-versa. Unlike the same dish at Xi’an Biang Biang Noodles, a bowl of sweet potato noodles turned out to be a remarkably unconvincing starter. 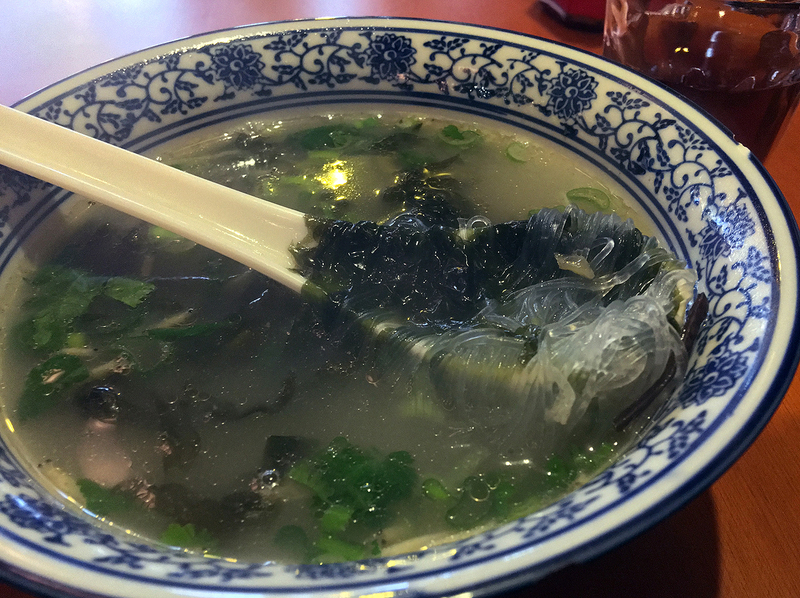 The thin vermicelli-style noodles had little to offer in either taste or texture and the soup was rather one-dimensional. That singular quality was at least a bracing chilli heat that had me mopping my glistening brow in short order. Conveniently, there are power sockets and USB charging ports underneath most of the tables and banquettes. 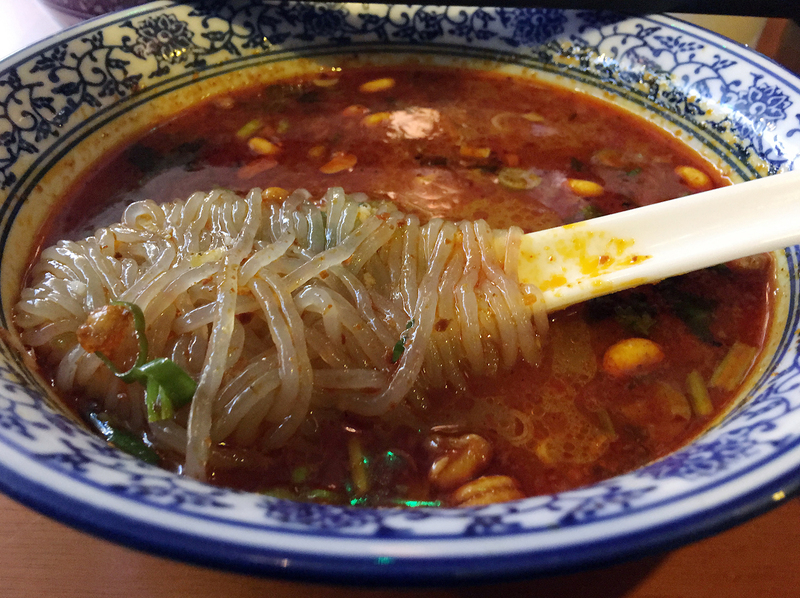 The differences that set Master Wei’s vegetarian biang biang noodles apart from the competition appear slight at first, but the cumulative effect is nothing short of showstopping. The wide, thick and roughly hewn yet smooth noodles had a gentle tug and bite, all of which gave them a notably refined mouthfeel. Both the noodles and the crisp bok choi stalks were apt conveyors for the aromatically musky sauce, its mild heat and garlicky umami inextricable from one another. I’ve rarely been more in love with a bowl of noodles. You can opt to have the biang biang noodles with pork in an egg, tomato and chilli sauce, but you’re better off sticking with the vegetarian version. The dense earthy bits of pork and the light heat of the sauce tinged with the sharp sweetness of tomatoes were fine in their own right, but couldn’t match the deceptively simple charms of the bok choi and special sauce in the vegetarian version. The flecks of scrambled egg just seemed out of place, bringing little to the party. I remain unconvinced that egg and tomato are the most apt accompaniments for biang biang noodles. 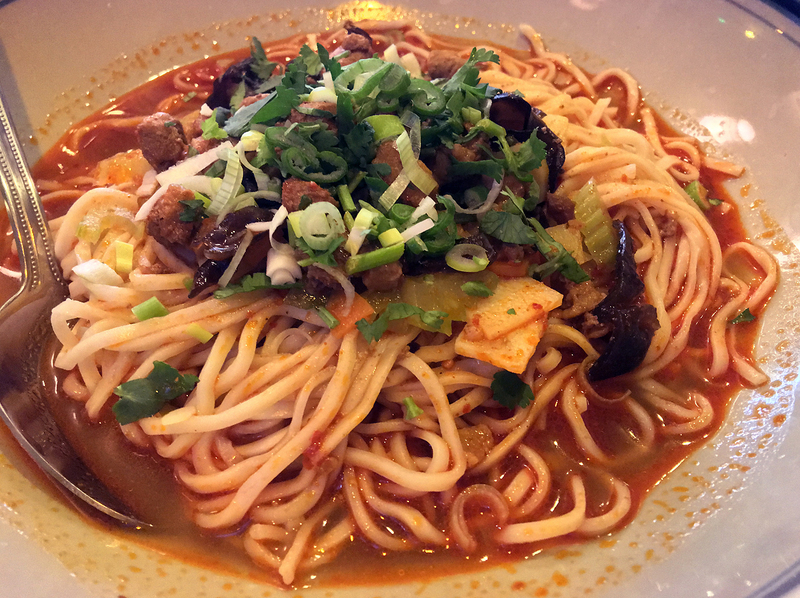 Qishan hand-pulled noodles were thinner and narrower than the biang biang noodles with squared off edges. They’re not going to displace the biang biang noodles from my affections any time soon, but they’re still worth scoffing. The diced pork topping had little to say for itself, but the moreish and sour sauce dotted with crisp spring onions and wrinkly fungus more than made up for it. I’d happily trade in the pork for more fungus. 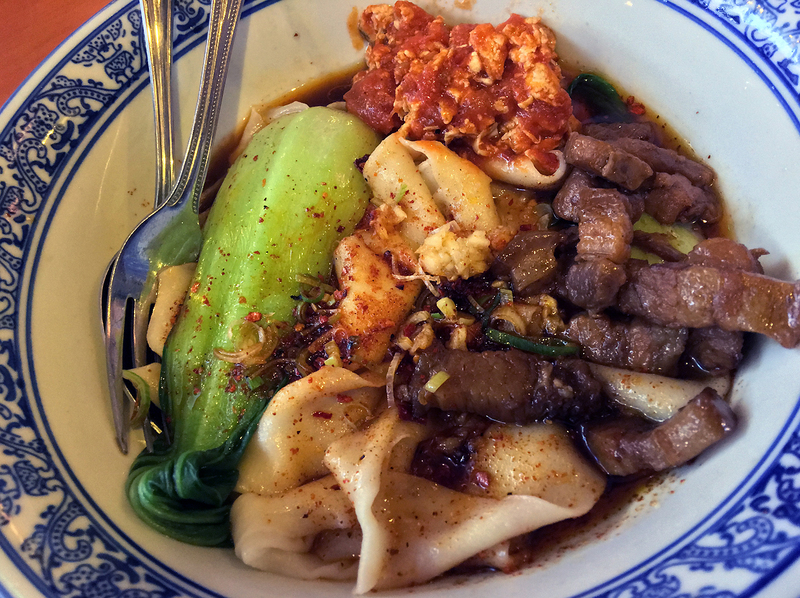 Wei’s hand-pulled noodles were very similar to the Qishan variety – if there’s supposed to be a difference then I can’t discern what it is. Surprisingly, the vegetables had little to say for themselves, but the gamey diced pork and thin sauce, with a taste of fermented beans and an alluring aroma surprisingly similar to tangy brown sauce, was more than sufficient compensation. I’d still rather have the biang biang noodles though. 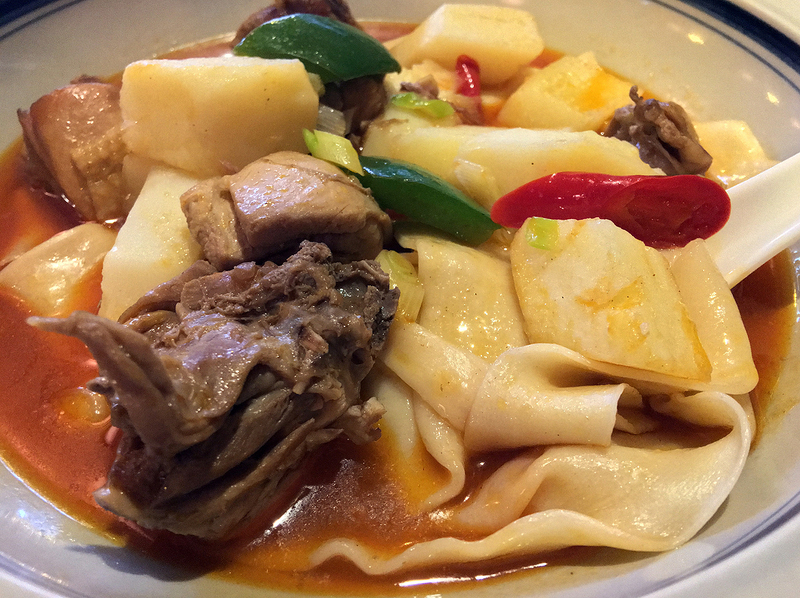 The Xinjiang-style hand-pulled noodles effectively used the same charming carb belts as the biang biang noodles along chunks of tender potato. Combined with the earthily moreish and moist bits of chicken on the bone – complete with dimpled and slithery skin – it was never going to be a complete duffer. Despite its multiple charms, it was let down by the one-note heat of the spicy sauce which wasn’t anywhere as lip smackingly nuanced as the sauce accompanying the equivalent dish at Etles. The sheer strength of the superior sauce on Etles’ noodles alone is enough for me to prefer that dish over this one, despite Master Wei’s more accomplished meat and arguably better quality noodles. Hand pull the other one. I’d have many regrets if I dropped dead tomorrow, but eating myself stupid at Master Wei wouldn’t be one of them. I can only speculate as to why, out of all the many regional Chinese cuisines, it has been Xi’an/Shaanxi food that has taken root in London over the past couple of years. But as much as I’d love to see more Hunanese or Jiangnan restaurants in London, I’m not going to look a terracotta horse in the mouth. This blossoming of rich, bold, nuanced Xi’an cooking in the capital, courtesy of the kitchen at Master Wei (and other restaurants), is a many-splendored thing that should be cherished and nourished. Long may it continue. Opening Hours: Monday-Thursday 11.30-22.00. Friday-Saturday 11.30-22.30. Sunday noon-22.00. Average cost for one person including soft drinks: £30-35 approx. 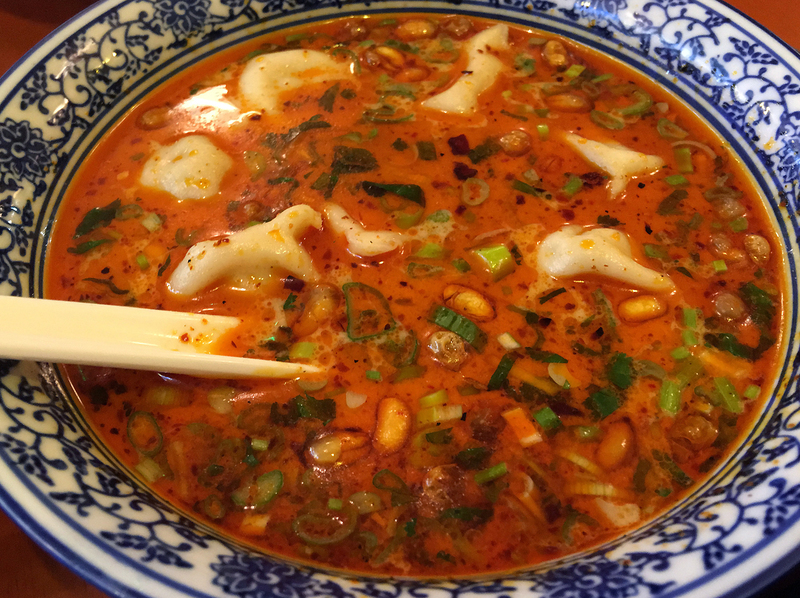 Tags: beef, biang biang noodles, chicken, dumplings, fungus, london, master wei, noodles, restaurant, review, salad, seaweed, soup, strawberries, won tons, xi'an impression. Bookmark the permalink.